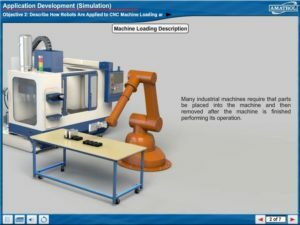 Amatrol’s Robotics 2 Simulation Learning System (96-RSS2) covers major topics like: how to connect a conveyor to the Pegasus robot; how to operate the conveyor; how to develop a robot program; developing programs to make a robot load and unload multiple automated machines; and much more! Learners will use the knowledge gained from these and other topics to simulate skills, such as: designing a robot program to perform go no-go inspection; entering a robot program that uses arithmetic and relational operators; and designing a robot application using For-Next commands. 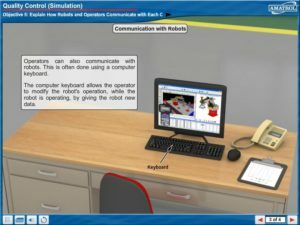 This system requires the Robotics 1 Simulation Learning System (96-RSS1) and a computer.